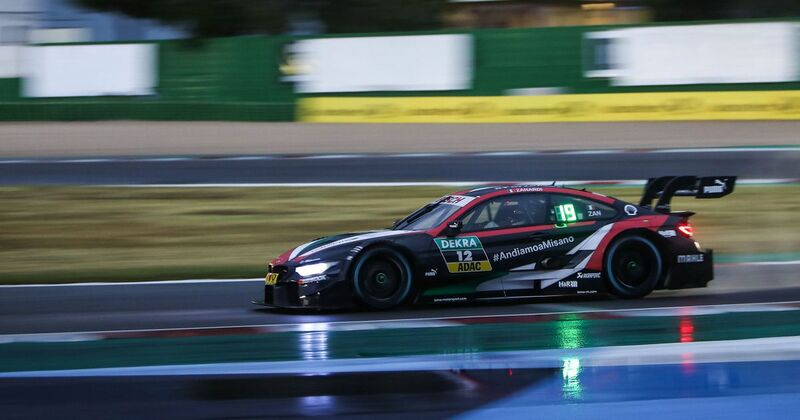 Rain threw a spanner in the works during the second race of DTM’s first ever weekend of night racing. Joel Eriksson mastered the conditions to take his first win, becoming the second-youngest winner of a DTM race after Pascal Wehrlein. With the youngest driver in the field having an awesome day, the oldest was making a decent fist of things, too. 51-year-old motorsport legend Zanardi (who famously lost his legs following a horrific Champ Car accident in 2001) made a guest appearance driving a specially-adapted car. He was a little off the pace for the whole weekend, but the unusual weather provided him with an opportunity for a result. On a drying track, he was one of four drivers who stuck with wet tyres long enough to benefit when the rain came down again. With most of the field crawling around on slicks and having to make a second stop, the wet runners gained a lap on everyone but Eriksson (who’d been the only driver to start on slicks). The safety car came out following a spin for Lucas Auer, and with the top five now pretty much a lap ahead of the rest, Zanardi’s strategy had proved to be the perfect one and he held on for a remarkable result. Eriksson’s gamble also paid off - by starting on slicks and making his sole mandatory stop early, he benefitted from the safety car closing everybody up and held on to take his first win. Zanardi isn’t done yet, either - next year he’ll race a BMW M8 GTE in the Daytona 24 Hours.